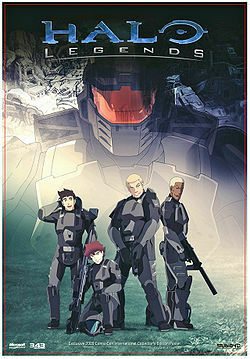 The Babysitter is one of the seven short films comprising the anime adaptation of the Halo universe, Halo Legends . Babysitter focuses on the rivalry between the SPARTAN-II commandos and the Orbital Drop Shock Troopers. The first preview of Legends and Babysitter was revealed on September 17, 2009 during Spike TV's GTTV Presents "Halo 3: ODST" Countdown to Launch . The Babysitter was released on November 7, 2009 for a limited time on Halo Waypoint. The Babysitter is focused around an ODST squad aboard the UNSC Kronstadt, who are sent on a mission to investigate alien ruins and assassinate a Covenant Prophet on Heian, a world in Covenant-controlled space. The story opens with ODSTs O'Brien, Dutch, and Checkman discussing their upcoming mission (with a Marine named Berger trying to eavesdrop on them); O'Brien, the squad's sniper, is upset that he's being replaced as the marksman on this mission. When Cortez, the squad's sergeant, sits down to join them, he brings news to the table that upsets the squad, especially O'Brien: the sniper replacing him is a SPARTAN-II, and he's the backup. When they arrive at the ruins site, Cal halts them, noticing a patrol of Unggoy and a Brute Chieftain. The SPARTAN orders them to take out the patrol covertly; Cal kills a grunt with a knife, Dutch knocks another one out, and Cortez breaks one's neck. As O'Brien prepares to sneak up on one, he alerts it to his position by stepping on a twig, and the nearby Chieftain also notices. The Chieftain moves to pulverize O'Brien with his gravity hammer as he takes out the Grunt with his SMG, only to be stopped by Cal, who grabs the hammer before impact. The Chieftain swings his hammer, knocking O'Brien and Cal back. O'Brien dangles from a cliff, and then a waterfall, losing his sniper rifle, and watches Cal fight the Chieftain in hand-to-hand combat. The Chieftain is ultimately thrown off of the waterfall, after being blinded in one eye by an elbow to the face. Cal picks up O'Brien as he loses his grip and carries him back to the squad. His contempt for Cal grows yet further, having been saved twice and humiliated in front of his squadmates. Finally, the squad reaches their destination two minutes before the Prophet lands. Cal sets up for the shot, and the Chieftain, who followed them from the ruins, ambushes the squad, attacking O'Brien first. Cal jumps in front of him, taking the hammer blow to the head and shoulder. Dutch, Cortez, and O'Brien collectively tackle the Chieftain, and Dutch unloads his SMG into the Chieftain's face, killing it. Cortez removes Cal's helmet to assess the injuries, and to the squad's shock, they find that Cal is a woman. Cal urges O'Brien to take the shot, claiming he's the only one that can do it. He hesitates, then picks up the rifle and takes the shot, killing the Prophet, and causing a major uproar among the Honor Guard at the landing site. Back on the Kronstadt, the squad is sitting at their table. Berger joins them and attempts to make small talk about their last mission, making the mistake of mocking Cal's combat skill by saying that SPARTANs just can't keep up with Helljumpers. The squad throws apples at him for making such a comment, and when he asks what he said wrong, O'Brien reflects silently on how Cal saved his life multiple times, and her death. Cal's sniper rifle's scope indicates that the weapon holds seven rounds. The ruins are neither of modern human nor Covenant origin. They also exhibit very little Forerunner design aesthetic - in fact, they have distinct Indian, Japanese, and Greco-Roman aesthetic elements, among others. In the DVD commentary, Frank O'Connor revealed that this mystery is an important plot point that will be explored in future Halo media. The ruins are mentioned once again in From the Office of Dr. William Arthur Iqbal, in which Dr. Iqbal speculates that the builders of the ruins may have borrowed from human architecture, or vice-versa. Information established in The Forerunner Saga hints that Heian was once an ancient human colony, either missed when Forerunners purged the galaxy of any remnant of human civilization after the Human-Forerunner wars or abandoned during one of humanity's technological dark ages long before humanity waged war against the Forerunners. When the HEVs are heading towards the planet there are five regular pods and one larger pod. The larger of the pods is the ODSTs' equipment pod. One of the ODSTs is Taylor "Dutch" Miles. Dutch plays a significant role in other Halo media, particularly as a playable character during the game Halo 3: ODST. ↑ Reuters.com - Prepare To Drop! Spike TV Gears Up For "Halo Month"